You probably know what you are doing in your job, but do you know who you are doing it for? As Christians in academia we probably have a pretty good idea of what we want to do: what experiments we want to conduct, what papers or books we want to write, and what ideas we want to critique. We spend quite a lot of time thinking about and planning these things. But how much time do we spend thinking about who we are doing it all for? If your experience is anything like mine, the answer is probably “very little”. The Christian’s whole desire, at its best and highest, is that Jesus Christ be praised. It is always a wretched bastardization of our goals when we want to win glory for ourselves instead of for him. When we arrange flowers in the church, or serve as an usher, or preach a sermon; when we visit the sick, or run a youth group, or attend prayer meeting—when we do any of these things, and more, with the secret desire that we might be praised for our godliness and service, we have corrupted the salvation we enjoy. Its purpose is to reconcile us to God, for God must be the center of our lives, the ground and the goal of our existence. Indeed, Christ himself, the agent of God in creation, is the one of whom Paul elsewhere declares that all things were made by him and for him (Col. 1:16). Lying at the heart of all sin is the desire to be the center, to be like God. So if we take on Christian service, and think of such service as the vehicle that will make us central, we have paganized Christian service; we have domesticated Christian living and set it to servitude in a pagan cause. In this post I want to explore one way that Christian academics can get to grips with the secular disciplines in which we work. I will begin by discussing two different ways in which we can understand the Christian faith and the way it shapes our work, before moving on to discuss a tool to help us think about academic disciplines in a way that opens a dialogue with the Christian faith. Jeremiah 29:7 But seek the welfare of the city where I have sent you into exile, and pray to the LORD on its behalf, for in its welfare you will find your welfare. 2 Corinthians 10:4-6 For the weapons of our warfare are not of the flesh but have divine power to destroy strongholds. 5 We destroy arguments and every lofty opinion raised against the knowledge of God, and take every thought captive to obey Christ, 6 being ready to punish every disobedience, when your obedience is complete. Colossians 3:23-24 Whatever you do, work heartily, as for the Lord and not for men, 24 knowing that from the Lord you will receive the inheritance as your reward. You are serving the Lord Christ. Each of these portions of the bible can serve as a mirror in which to see reflected our academic studies. There is nothing wrong with this mirror approach in itself; certain verses and passages do provide us with a privileged site for meditating on what it means to work as a Christian. Say I am a Christian in the creative arts. I structure my approach to my work around the biblical truth that God is a creator and that I, in his image, have been made with the ability to create and therefore should express that ability. Now imagine I am that same Christian in the creative arts, but now I reflect my work in a different biblical mirror. I know from the bible that this world is ‘fallen’ and under God’s judgment, and so I determine to have nothing to do with the culture in the world around me as I conceive and produce my art, separating myself as much as I can from all influences that would contaminate my work. The truths expressed in these two pictures (namely that part of what it means to be in the image of God is to be creative, and human culture is, at least in one important sense, fundamentally opposed to God and under his judgment) are not incorrect, but they are partial. They are truths, but they are not the whole truth, and if I give them undue weight in my approach to my discipline I should not expect that approach to be biblical at all. Creativity does not adequately summarise what the bible has to say about working as a Christian, and neither does the truth that all that human beings do is tainted by sin. Both of these truths need to find their place as part of a bigger, balanced picture. As the history of heresy has shown us, it can be just as dangerous to hold the right truths in the wrong proportions as it is to hold the wrong truths altogether. that stance is most likely to be deeply Christian which attempts to integrate all the major biblically determinate turning points in the history of redemption: creation, fall, the call of Abraham, the exodus and the giving of the law, the rise of the monarchy and the rise of the prophets, the exile, the incarnation, the ministry and death and resurrection of Jesus Christ, the onset of the kingdom of god, the coming of the spirit and the consequent ongoing eschatological tension between the “already” and the “not yet,” the return of Christ and the prospect of a new heaven and a new earth. D. A. Carson, Christ and Culture Revisited (Grand Rapids: Eerdmans, 2012) 81. At first blush this might seem like an impossibly daunting task for the Christian academic. The bible contains 66 rich and varied books that each repay years and even decades of study by theologians who have more time than we do to devote to the task. How can we possibly bring the weight of all that wisdom to bear on our studies? That is where the map approach comes in. A map does not give exhaustive information about any single elements of the landscape it represents. In fact it tells us very little about any of the features it depicts. What it does show brilliantly is how some important features within a the landscape are situated in relation to each other, giving a big picture that allows the map-reader to appreciate the landscapes’ features relative to each other, and if need be to navigate her way to them one by one. A number of good resources are available to help Christians gain a map view of the whole bible; Graeme Goldsworthy’s Gospel and Kingdom and Vaughan Roberts’ God’s Big Picture to name but two. However, for the purposes of mapping not just the Christian faith but our academic disciplines I want to use a more visual way of distilling the bible’s core message: the “Two Ways to Live” framework. For those not familiar with Two Ways To Live, let me give a brief explanation. It seeks to express the bible’s core storyline in six key truths, represented in six pictures. Like a map, it is not exhaustive; like a map, it begins to provide a good sense of the important features. 1. God is the loving ruler of the world. He made us rulers of the world under him. 2. We all reject the ruler – God – by trying to run life our own way without him. But we fail to rule ourselves or society or the world. 3. God won’t let us rebel forever. God’s punishment for rebellion is death and judgment. 4. Because of his love, God sent his Son into the world: the man Jesus Christ. Jesus always lived under God’s rule. Yet by dying in our place he took our punishment and brought forgiveness. 5. God raised Jesus to life again as ruler of the world. Jesus has conquered death, now gives new life, and will return to judge. Let me sound a note of caution at this point. Two Ways To Live is a helpful framework to use but, as I stressed in the post about the Christian academic’s full body workout, the level of sophistication with which we understand the Christian faith should keep pace with the level of sophistication with which we engage with our academic disciplines. Our need is not to move on from the truths sketched in Two Ways to Live, but to deepen our knowledge of them, teasing out their implications for all aspects of the Christian worldview. Two resources I can recommend for going deeper in this way are Richard Pratt’s Every Thought Captive: A Study Manual for the Defense of the Christian Faith, and John Frame’s lecture course on “Christian Apologetics”, available on iTunesU. Both of these resources contribute to showing how the map of biblical truths richly shapes a Christian understanding of the whole of life. To take just one example, in relation to box 1 of Two Ways to Live Frame shows how the Christian understanding of God as being both personal (not an impersonal force or ‘first mover’) and absolute (not part of the universe he created) has far-reaching consequences for an understanding of ethics, the world and human life. As we familiarise ourselves with an ever more detailed “map” of the Christian faith we will be better equipped to understand how the bible might inform our approach to our academic disciplines. But this is not the only map we need to be drawing. It is also profitable to map our disciplines themselves, and it is to this less familiar task that I now turn. Most academic disciplines do not tell a historical story in the way that the bible does, but they can still usefully be mapped. The disciplines we work in are not just piles of facts or ideas, any more than the bible is just a pile of verses; they have their own narratives, assumptions and goals. Mapping a discipline can help us better understand the major structural themes that undergird it. It is a useful exercise for any academic, Christian or not. I suggest that it is useful to begin mapping a discipline by taking six boxes, like the Two Ways to Live outline. Six is not a magic number but it is a manageable number, and we need to keep in mind that the aim of the exercise is to gain an overview, not to give an exhaustive account. 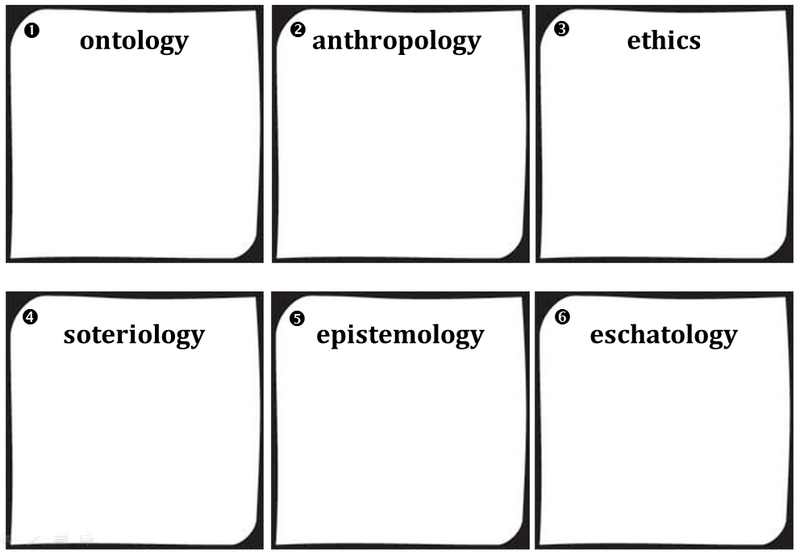 The following six boxes do not map directly onto the six truths of Two Ways to Live, but they do provide a tool to distill an academic discipline into categories similar to those used by Two Ways To Live. I invite you to complete the following exercise: In each box, summarise the way in which your discipline tends to think about the issue raised in the box’s title. Below the six boxes I have suggested some questions you might want to ask yourself in order to help you think what to write. What is the first principle or beginning point in the discipline? What is assumed rather than argued for? What assumptions does everybody (or nearly everybody) in your discipline make, but nobody question? What are the historical origins of this discipline? What is it reacting against or trying to renew? Anthropology: what is a human being? Ethics: what is right and wrong? What is or are the major problem(s) that my discipline is trying to fix or address? According to my discipline, what is wrong with the world? What is ‘good’ and what is ‘evil’? What is a virtuous thing to do in my discipline? What is the worst thing you could possibly say or do, academically, in the eyes of your colleagues? What is the one thing that, if you said it at an academic conference in your discipline, you would get heckled and people would walk out? For your discipline, who are the “baddies”? Soteriology: what is the solution to our problems? What is the solution to the problem identified in box 3? How are the consequences of the problem to be addressed? What are we fixing? How and why are we fixing it? How will we know whether the solution from box 4 has worked? What is the measure of victory/success? Eschatology: what is the endgame? What meaning(s) does all of the above give to human history and human life? What is life all about, according to my discipline? If the leaders of your discipline became the leaders of the world, what would the world look like? For individual methodologies or positions: what bigger story is this part of? What story is being told and what are its values and assumptions? What other stories are not being told? In order to answer some of the questions, you might find it helpful to start by thinking of an explicit goal of your discipline and drawing an “assumptions pyramid” (I’ll explain what that means in a future post) to find what that goal takes for granted. However, even with assumptions pyramids and a strong cup of coffee you might well find this exercise unusually taxing. It can be difficult to unearth guiding principles and assumptions that lie below the surface, but Christians should be well placed to do that spade work. After all, Christians are used to living in a culture that does not share many of their assumptions and truths; how many people in the institutions for which you work would respond to the truths of Two Ways To Live with the reply “but of course; that’s just how I see the world too”? We are used to our Christian view being in a minority, and having to think it through and defend it from first principles, and the current exercise is merely asking us to extend the same sort of self-awareness and thoughtfulness to an academic discipline. Take some time to work through the six boxes for your own discipline, your sub-discipline, or even one particular thinker or theoretician in your area. So you’ve mapped your discipline. Now what? First of all, well done! You’ve taken an important step towards better understanding and serving the academic community of which you are part, and towards coming to terms with that community’s deep structures. As you continue reading and constructively serving in your discipline, be aware of the moves it is making, the bigger picture that makes sense of those moves, and the set of assumptions into which they fit. Understand why certain things are written about often, others seldom and some never. Understand not only what your discipline says, but why it says it (in the two senses of “based on what assumptions?” and “to what end?”). Make sure that you understand your discipline well, so that you can ‘walk in its shoes’. Now that you have a map of the Christian faith and a map of your discipline, you can begin the slow and careful process of understanding the latter in terms of the former. Which features of the map do your faith and your discipline share? Where are they most at variance, and why? At what points might the map of the discipline helpfully show the way to neglected features on the Christian map, and vice versa? Don’t feel you now need to go away and reinvent your discipline overnight, or start shouting about its assumptions right away. Take Nicholas Wolterstorff’s advice and let your understanding of your discipline develop slowly. If you are a Christian in academia, here is a question to ask about your discipline or sub-discipline: what are its goals or ends? How do people in your field justify doing what they do? There is always a rather mundane answer to this question: we do what we do so we can get a qualification that will lead to a job, or to keep our jobs so that we can put food on our family’s plates. But there are also bigger answers: in the story that your discipline tells about itself to the world, is it about improving global health, or efficiency, or knowledge? Once you have an answer or answers to that question, ask again: Why is efficiency better than inefficiency? Why should everyone be healthy, and not just the rich? Why is having more knowledge better than having less? Pursue the question until you arrive at a value that cannot easily be reduced to anything more fundamental (examples might be the equality of all human beings, or human autonomy). The ends of our disciplines are informed by fundamental and often unspoken values that all successful scholars in the discipline share, but that are very rarely questioned or even discussed. Bias leading to error.—It is a deplorable thing to see all men deliberating on means alone, and not on the end. Each thinks how he will acquit himself in his condition; but as for the choice of condition, or of country, chance gives them to us. Similarly in the academy the final end for which a particular project or question is being pursued can emerge almost by chance, whereas the means to pursue it are poured over in minute detail and hotly debated. What ends is your discipline pursuing? Why is your discipline pursuing them? What are the values it is necessary to hold in order to see those ends as desirable? How do they compare to God’s ends and priorities as revealed in the bible? In this post I want to consider one word from the wisdom literature in the bible. It is the word for wisdom itself, transliterated into English as chokmah. This word is used to describe what the fear of the LORD is the beginning of in psalm 111; it is what Bezalel and Oholiab are given when they make the tabernacle in Exodus 36; it is what God gives to Solomon; and it is what Job longs his comforters would show by shutting up (Job 13:5). The wisdom described in these verses that of a philosopher, poet, musician and natural scientist, and this wisdom seen as a wonderful thing, which the bible commends and commands us to seek. In addition, according to Stephen in Acts 7:22 Moses was “educated in all the wisdom (sophia, the closest NT equivalent for chockmah) of the Egyptians”. Stephen does not condemn this pagan education as evil, but, as Dennis Johnson puts it, he “concurs with the Jewish tradition’s positive assessment of Moses’ intellectual engagement with pagan wisdom.” And I have already written about Daniel’s professorship at the university of Central Babylon. The book of Proverbs describes a man who both sought and taught wisdom, and the book’s seamless blending between what we would call “spiritual” and what we would call “practical” proverbs indicates that the wisdom literature in the bible does not draw as polarised a dichotomy as we tend to do. Dennis E. Johnson, “Spiritual Antithesis, Common Grace, and Practical Theology,” inaugural address, photocopied, accepted for publication in Westminster Theological Journal 64:1, Spring 2002, 74.